of the run / walk (Sunday, 9/13) beginning at 7:30 AM. Packet pick-up will be available Friday, Sept 11 from 4-7 PM at the Portsmouth Chamber of Commerce located at 500 Market Street in Portsmouth. 5K STREET / LOT CLOSURES: Parrott Avenue will be closed the morning of the 5K. You will NOT be allowed to park on Parrott Avenue or in the parking lots of the library, the Middle School, or the Connie Bean Center. SECOND EVENT DOWNTOWN STREET CLOSURES: There is another event that is taking place downtown that will necessitate some street closures - namely State Street and Congress Street between and including Maplewood and Penhallow. If you plan to park NORTH of Congress Street you will be fine to walk to the school. If you plan to park in a lot SOUTH of the school we recommend that you come in via South Street to Junkins Avenue as opposed to trying to drive through town (unless you are very familiar with downtown back roads). This is a good option because City Hall will be closed and there is a large lot next to it with @200 spaces. There is also a large lot on the corner of Parrott Avenue and Junkins Avenue. Please give yourself ample time in case you run into parking problems. Additional parking lot options can be found on the Park Portsmouth website. We have some fun activities for the kids including face painting and a Kid's Fun Run. Be sure to visit the Kid's Tent when you arrive to sign your child up for the Fun Run (it will take place around 10:15). Strollers are allowed, however we ask that you stay toward the back of the participants so you don't block their way. As with past years we do everything we can to get over the bridge and back before it goes up to allow boat traffic through. 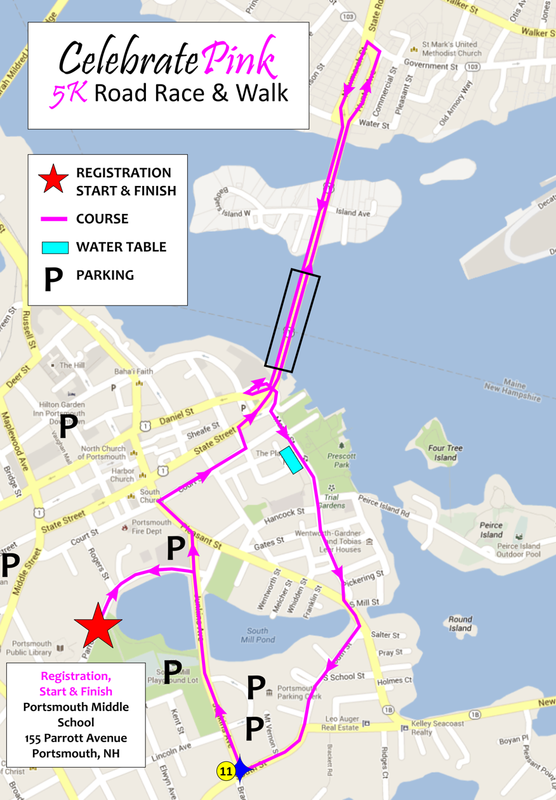 The start of the race may be adjusted by a couple of minutes to accommodate the bridge schedule (if need be). Also, it's very important that you run/walk on the sidewalks and bike path, and NOT down the middle of the bridge. We need to obey the NH DOT rules in order to continue to include the bridge as a part of our course. If you have been fundraising on our behalf, THANK YOU! If you have donations with you on Sunday please bring them to the My Breast Cancer Support booth inside the school. We have some AWESOME raffles this year including tickets to Seacoast Rep, pearl/crystal earrings from Madeleine's Daughter, a leather handbag from Timberland, tickets to the Fisher Cats and more. Be sure to tuck some money in your pocket before you leave home! *NOTE: You will need to be present at the time of the drawing to win any items. Please be sure to visit the Survivor Table near registration to pick up a special gift thanks to a generous donation by McLaughlin Transportation. We get so excited to see all the wonderful costumes people come up with each year! We also have prizes for the best team and individual costumes. Be sure to visit the My Breast Cancer Support booth when you arrive and sign up to be considered.